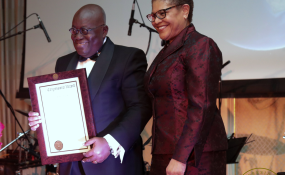 Rep. Karen Bass (D-CA), presenting a Congressional commendation to President Nana Akufo-Addo of Ghana, during a gala in Washington, DC hosted by the Whitaker Group, which presented 'exemplary leadership' awards to the president and Rep. Ed Royce (R-CA). It is an honour to be amongst you – Excellencies, Ministers, Ambassadors, Members of the US Congress, distinguished guests, and friends – at the Gala Dinner organised by the Whitaker group in celebration of Africa, a continent of unlimited possibilities. I have to begin by congratulating my good friend, Rosa Whitaker, on 15 years of exceptional achievement. We met over 15 years ago, when I was Ghana’s Foreign Minister in the government of the outstanding Ghanaian statesman, President John Agyekum Kufuor, and have been firm friends since. She was very helpful to the Kufuor government in finding our way around the labyrinth that is Washington D.C. Her love of Ghana, of Africa, and her peoples shone through everything she did. You can imagine our pleasure when she decided to become a full-blown Ghanaian, when she married one of the most notable figures of faith in our country and continent, His Eminence Archbishop Nicholas Duncan Williams. From what we can all see, the marriage has made her even stronger. The Archbishop has to take some of the credit for that. So, to both of you, I say, in our parlance, a big ayekoo. On behalf of the people of Ghana, I thank Rosa Whitaker and the Whitaker Group warmly for the honour of this award – The Exemplary Leadership Award. Ghanaians are deeply humbled by the award, and we accept the challenge that it imposes on us, and in what the world expects of Ghana and of Ghanaians. I congratulate the Honourable Edward Royce, Chairperson of the Committee on Foreign Affairs of the United States House of Representatives, who is my fellow honouree for the evening. To Rosa Whitaker, and the team at Whitaker Group, I say thank you for this exceptional show of appreciation. There is so much for us to celebrate as Ghanaians, as Africans, as Americans and as friends. Over the course of our history, the Ghanaian people have had to overcome several trials and tribulations: slavery, imperialism, colonialism, tyranny and dictatorship. We once lived in a country where freedom of speech was suppressed; where the safeguards of trial -- the rule of law -- were set aside; where individual property rights were disregarded by the state, because the citizen had no guaranteed rights; and where citizens went to jail for expressing honest opinions. Nonetheless, what our history has taught us is that the spirit of the Ghanaian, in his or her quest for peace, progress and prosperity, cannot be quenched. We are a determined lot, who cannot be deterred. It took us a while, but the consensus on multi-party constitutional, democratic rule has been established in Ghana. For the third time, the most recent being in December 2016, we had a peaceful transfer of power from a governing party to an opposition one. We did it without any fuss, and it is now part of what we do as a people. It is within this period of 25 years that Ghana has witnessed a consistent period of achievement. Today, after quite some time, we are recognised as a beacon of democracy and stability on the African continent. We are a country governed by the principles of democratic accountability, respect for individual liberties and human rights, and the rule of law, an aspiring modern nation. The time has now come for us in Ghana to move on even further to deepen our democracy. We must trust the individual and collective wisdom and good sense of our people. We must create wealth and provide happiness to our nation. We can only do this when we have a powerful private sector, with a strong sense of enterprise, innovation and creativity, and an educated and skilled population that is capable of competing in the global marketplace. This is why we are insisting on making basic education, i.e. kindergarten through primary school to junior high school to senior high school, free in all our public schools, to guarantee access to quality basic education to all of Ghana’s children, irrespective of the circumstances of their birth. In doing so, we must expand our horizons and embrace science and technology as critical tools for our development. We want to create a society of opportunities and incentives. We have to build a confident Ghana which is united, at peace with itself and takes pride in its diversity, and which continues to pursue its historic pan-African vocation. It will not be easy. We have no illusions whatsoever about the nature of the task that we face, but I know that Ghanaians will rise to the occasion; they always do. The Black Star is going to shine and shine and shine, and we are going to build a Ghana Beyond Aid. It is a pity that the howling winds of Washington D.C. prevented us from holding this event at its original venue – the National Museum of African American History and Culture. I had looked forward to that very much, not only because its arresting structure was designed by a favourite son of Ghana, David Adjaye, one of the most iconic of contemporary global architects, but also because of the history it apparently tells of the influence of Africans on America’s evolution, tragic, inhumane and barbarous, though, their coming to America was. Their achievements here testify vividly to the resilience of the African, and our determination to survive, no matter the odds. Africans here, Africans in the Americas, Africans on the continent – together, we shall overcome. The 21st century is going to be our time. We are going to realise our unlimited possibilities, and establish, conclusively, our greatness. That is my deep-seated, unalterable belief. I thank the Whitaker Group once again for the award. It is good to be able to show that standing up for democracy, respect for human rights and the rule of law has its rewards. May God bless us all and the peoples of Ghana and the United States, and may God bless our homeland Ghana, and make her great and strong. Thank you. Medaase paa.